If it is a little while since your last Thailand golf tour, or if your on a golfing holiday in Thailand for the first time, you will need to be aware that Bangkok now has two airports, Suvarnabhumi (pronounced su-wan-na-poom), and Don Muang. All international airlines fly in and out of Suvarnabhumi, while domestic flights are operated at both airports. Domestic flights with 3 digit flight numbers and the airport code BKK operate at Suvarnabhumi, while those with 4 digit flight numbers and the airport code DMK operate to/from Don Muang. For those golfers who have been used to arriving in from overseas at Don Muang, you will be pleasantly surprised at the ultra-modern Suvarnabhumi, especially if you fly in at night when the airport buildings are spectacularly floodlit. Not that the new airport has been without teething problems. After numerous delays, the airport opened for all commercial flights September 2006. The airport, 25 km east of Bangkok, is the main hub for all international airlines. The name Suvarnabhumi (“Golden Land”) was chosen by King Bhumibol Adulyadej and refers to the ancient kingdom hypothesized to have been located somewhere in Southeast Asia. Designed by Helmut Jahn, Suvarnabhumi has the world’s tallest control tower, and the world’s second largest single building and airport terminal, just a little smaller than Hong Kong International Airport. 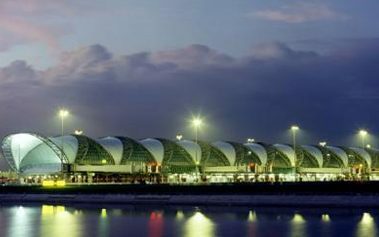 The airport replaced the old Don Muang International Airport which was the fourth busiest airport for passenger traffic in Asia in 2005, as Bangkok’s primary airport for all commercial airline flights. It also inherited the IATA Airport Code BKK from Don Muang after the older airport ceased commercial flights. Getting to and from Suvarnabhumi is relatively easy. The airport has 5 main access routes. Among these the most convenient route is via the Bangkok-Chonburi Motorway. Metered taxis are available outside the exit on the 1st floor. The trips to the city will cost 300 – 400 baht and take 40 – 60 min. depending on traffic. Additionally, flat-fare limousines are available at 2nd Floor Arrivals Level. The City Airport Terminal and high-speed rail link to the new airport is planned for completion in November this year, and construction is going well. One aspect of the old Don Muang airport that we shall all miss is the RTAF golf course located between the two runways. The course has no separation from the runway, and golfers are only held back by a red light when planes land. Two incidents that spring to my mind: firstly, when a Japanese four-ball were waved through by the captain of an international flight awaiting a gate, resulting in much bowing; and, secondly, when an out of control Quantas aircraft careered on to the golf course causing much discussion as to whether the wreck should be treated as an immovable obstruction under Rule 24-2, or a natural hazard! On the other hand golfers in Thailand using the new airport will be able to take advantage of the championship Royal Golf and Country Club, only 10 minutes away. A quick round while waiting for your connection is a great idea; just be careful when putting. The Royal has some of the fastest greens in Bangkok!